Professional sports can be a “what have you done for me lately” type of business, particularly when it’s such a results-oriented world. As a consequence, it’s rare to see organizations remain patient with the development of their young players – especially if they were high-profile first round draft picks. For the Calgary Flames, patience has been the watch-word in regards to 2012 first round pick Mark Jankowski. Six seasons after his initial selection, Jankowski has quietly carved out a niche as a key role player for the Flames. 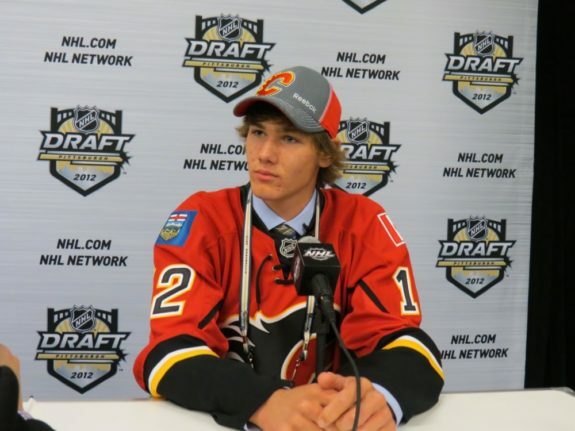 The spotlight was shone on Jankowski early when the Ontario product was selected by the Flames 21st overall in the 2012 NHL Draft. Infamously, the Flames traded down from 14th overall to recoup a previously-traded second round pick, then selected Jankowski (then a relatively unknown forward from a Quebec prep school) rather than more highly-touted prospects such as Olli Maatta. Then-general manager Jay Feaster arguably made things worse, comparing Jankowski to Hockey Hall of Famer Joe Nieuwendyk and predicting that he would be the best player from that draft in 10 years. Rather than get intimidated by the hype, Jankowski enrolled at Providence College and got to work. Over four seasons with the Friars, Jankowski gradually became a reliable two-way presence and then built an offensive touch onto his 200-foot game. He was named a conference playoff all-star during Providence College’s 2015 NCAA championship season, then returned for his senior year and served as an on-ice leader for the Friars – he was named a Second Team All-American. Over his four seasons in the NCAA, Jankowski’s offensive numbers showed a steady up-tick year over year. Jankowski turned pro at the end of the 2015-16 season, playing a handful of games at the end of the American Hockey League schedule. Heading into his first full pro campaign, the expectations were fairly modest: maybe he’d become a reliable AHLer and then build up his game, as he did as a college player. It’s probably safe to say that he exceeded expectations. His first pro season saw Jankowski score at just under a point-per-game pace, scoring 56 points in 64 games and led all AHL freshmen in goals. As a rookie, he emerged as one of the top players for the Stockton Heat. He entered his second pro training camp motivated and while he didn’t make the Flames out of camp, he was called up to the NHL just prior to Halloween and never returned. He played 72 games with the Flames, putting up 17 goals and 25 points and showing flashes of brilliance. His sophomore NHL season has seen Jankowski take a big step. 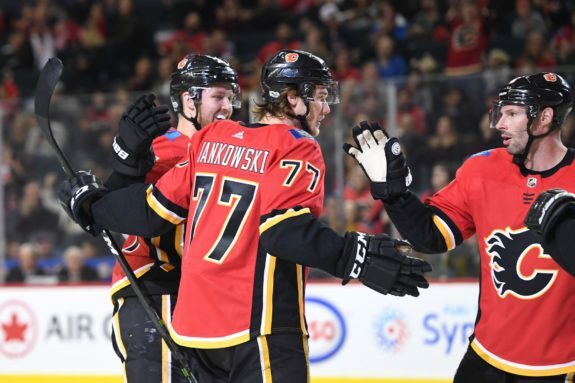 The benefit for Jankowski of playing on a Flames team that tumbled down the standings near the end of last season is that he got a chance to play a lot of different situations. He found himself in the penalty kill rotation by happenstance and ended up being pretty good at it. As the this season began, Jankowski’s old AHL head coach Ryan Huska became an assistant coach for the Flames and was tasked with running the penalty kill. Some strong results have cemented Jankowski’s spot on the team’s penalty kill in just his second NHL season and given him a key role few young players are able to carve out. After a slow start to the season, the Flames’ penalty kill has emerged as equal parts defensively stingy and offensively potent. They tend not to give up a ton of scoring chances, while becoming the league’s leader in shorthanded goals. A lot of that can be traced to Jankowski, who’s become the NHL’s leader in shorthanded goals and points while developing an uncanny ability for generating odd-man rushes while the Flames are playing a man down. Can Special Teams Success Translate? Through a season and a half in the NHL, Jankowski has shown to be a competent if unspectacular player at even strength, but has developed a ton of confidence in his special teams role. On a team with a strong top six forward group, the special teams role has become Jankowski’s main way of standing out and making a difference in the Flames’ games. While he’s still young and has a long of development still ahead of him, the team undoubtedly hopes that the confidence and swagger that Jankowski plays with can bleed into the other elements of his game. If Jankowski can get the rest of his game going, he could transform into a very valuable asset for the Flames going forward.